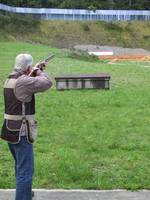 North Saanich Rod & Gun Club currently supports a variety of shooting activities including Archery, Black Powder, Cowboy Action, Trap, High Power Rifle, Smallbore Rifle, Sporting Rifle and Bullseye Pistol. Club members interested in these different styles of shooting have organized themselves into groups within the club and meet on a regular basis. Members interested in these different shooting programs usually meet at least once a month at a designated time up at the club so that those with common interests in a particular style or discipline of shooting can learn from each other. Many of these activities are open to non-NSRG shooters. Please check out our list of current programs for information and to learn more about an activity that may appeal to you. Program schedules are subject to change due to Special Events such as rentals and special matches. Please check the NSRG Range Schedule Calendar on the Schedules page regularly to keep aware of any changes.